When “Stuck in the Middle” is Not a Danger? “Ortada takılı kalma” ne zaman bir tehlike değildir? In the new IT-enabled network marketing, the competition goes to global and the needs and expectations of the customers change rapidly. It is easy to reach the information about the price and the quality of the competing products and services via the web by the increased accessibility and availability of market information for both buyers and sellers. It requires to compete in both cost effective and differentiated way to compete globally. In this study, the competitive forces and the competitive strategies to come up with these forces is explained in detailed and also the growing effect of the Internet and global competition on the strategy choice of the companies is discussed. This study supports the idea that being “stuck-in-the middle” is not a danger in IT-enabled network marketing and also it is necessary to be successful in the global competition. Yeni IT-destekli ağ pazarlamasında rekabet giderek globalleşmekte ve müşterilerin ihtiyaç ve beklentileri hızla değişmektedir. Pazar bilgilerine erişilebilirliğin artması ile hem alıcılar hem de satıcılar için web üzerinden rakip ürün ve hizmetlerin kalitesi ve fiyatı hakkında bilgilere ulaşmak kolaylaşmıştır. Bu durum, küresel olarak rekabet edebilmek için hem maliyet etkin hem de farklılaştırılmış bir şekilde rekabet etmeyi gerekli kılmaktadır. Bu çalışmada, rekabet güçleri ve bu güçlerle başa çıkabilmek için uygulanan rekabet stratejileri detaylı olarak açıklanmakta ve ayrıca İnternetin ve küresel rekabetin işletmelerin strateji seçimlerindeki artan etkisi tartışılmaktadır. Bu çalışmada, “Ortada Takılı Kalma”nın IT-destekli ağ pazarlamasında bir tehlike oluşturmadığı ve küresel rekabette başarılı olmak için gerekli olduğu fikri desteklenmektedir. Akan, O., Allen, R. S., Helms, M. M., & Spralls III, S. A. (2006). Critical Tactics for Implementing Porter’s Generic Strategies. Journal of Business Strategy, 27(1), 43-53. Allen, R. S., & Helms, M. M. (2006). Linking Strategic Practices and Organizational Performance to Porter’s Generic Strategies, Business Process Management, 12(4), 433-454. Bakos, Y. (1991). A Strategic Analysis of Electronic Marketplaces. MIS Quarterly, 15(3), 295-310. Baroto, M. B., & Abdullah, M. M. B. (2011), The Application of Cost, Differentiation and Hybrid Strategy In Business Operations: Will Hybrid Strategy Become The New Competitive Strategy?. ICBER 2011 Proceedings, 1362-1370. Booth, M. E., & Philip, G. (1998), Technology, Competencies, and Competitiveness: The Case for Reconfigurable and Flexible Strategies. Journal of Business Research, 41, 29-40. Bowman, C. (1992). Interpreting Competitive Advantage. In D. Faulkner & G. Johnson (eds. ), The Challenge of Strategic Management, London: Kogan Page Ltd., pp. 64-83. Campbell-Hunt, C. (2000). What Have We Learned about Generic Competitive Strategy? A Meta-analysis. Strategic Management Journal, 21, 127-154. Day, G. S. (1989). Decoding How to Compete. Planning Reveiw, September/October, 18-23. Dess, G. G., & Rashed, A. M. A. (1992). Commentary to D. Miller’s Generic Strategies), Advances in Strategic Management, 8, 409-416. Dickson, P. R., & Ginter, J. L. (1987). Market Segmentation, Product Differentiation and Marketing Strategy. The Journal of Marketing, 51(2), 1-10. Gopalakrishna, P., & Subramanian, R. (2001). Revisiting the Pure Versus Hybrid Dilemma: Porter’s Generic Strategies in a Developing Economy. Journal of Global Marketing, 15(2), 61-79. Hill, C. W. (1988). Differentiation versus Low Cost or Differentiation and Low Cost. Academy of Management Review, 13, 401-412. Kiang, M. Y., Raghu, T. S., & Shang, K. H—M. (2000). Marketing on the Internet-who can benefit from an online marketing approach?. Decision Support Systems, 27, 383-393. Kim, E., Nam, D., & Stimpert, J. L. (2004). The Applicability of Porter’s Generic Strategies in the Digital Age: Assumptions, Conjectures, and Suggestions. Journal of Management, 30(5), 569-589. Kim, L., & Lim, Y. (1988). Environment, Generic Strategies, and Performance in a Rapidly Developing Country: A Taxonomic Approach. Academy of Management Journal, 31(4), 802-827. Kim, W. C., & Mauborgne, R. (2005). Blue Ocean Strategy, Harvard Business School Press. Lawlor, B. R. (2007). The Age of Globalization: Impact of Information Technology on Global Business Strategies. The Honors Program Senior Capstone Project, Bryant University. Miles, M., & Covin, J. (2000). Environmental Marketing: A Source of Reputational, Competitive, and Financial Advantage. Journal of Business Ethics, 23, 299-311. Miller, D. (1988). Relating Porter’s Business Strategies to Environment and Structure: Analysis and Performance Implications. Academy of Management Journal, 31(2), 280-308. Murray, A. (1988). A Contingency View of Porter’s Generic Strategies. Academy of Management Review, 13(3), 390-400. Oh, W., & Lucas Jr., H. C. (2006). Information Technology and Pricing Decisions: Price Adjustments in Online Computer Markets. MIS Quarterly, 30(3), 755-775. Pelham, A. M. (1999). Influence of Environment, Strategy and Market Orientation on Performance in Small Manufacturing Firms. Journal of Business Research, 45(1), 33-46. Porter, M. (1980). Competitive Strategy. Free Press, New York. Porter, M. (1985). Competitive Advantage. Creating and Sustaining Superior Performance. Free Press, New York. Porter, M. (1991). Towards a Dynamic Theory of Strategy. Strategic Management Journal, 12, 95-117. Powers, T. L., & Hahn, W. (2004). Critical Competitive Methods, Generic Strategies and Firm Performance. International Journal of Bank Marketing, 22(1), 43-64. Proff, H. (2000). Hybrid Strategies as a Strategic Challenge. The Case of the German Automotive Industry, Omega. The International Journal of Management Science, 28, 541-553. Ridderstrale, J., & Nordström, K. (2002). Funky Business: Talent Makes Capital Dance. Pearson Education. Song, J., & Zahedi, F. (1998). Determinants of Market Strategies in Electronic Markets. AMCIS 1998 Proceedings, 120. Ülgen, H., & Mirze, K. (2016). İşletmelerde Stratejik Yönetim. Beta Basım Yayın, İstanbul. ISNAD ERDOĞAN TARAKÇI, İnci , BAŞ, Mehmet . "When “Stuck in the Middle” is Not a Danger?". 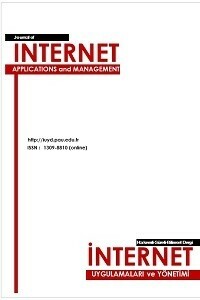 Journal of Internet Applications and Management 9 / 2 (December 2018): 49-63.